Minnie loves to listen to kids read stories to her. She doesn’t pass judgment on shy readers or those who might need a little extra help. In the library, she tries to meet as many children as possible, so she visits schools often. Amos accompanies child victims to court. He is allowed in the witness box and works with children prior to testifying and in the decompression after the harrowing process. Minnie is Lisa Saroyan’s Pomeranian. She is also a licensed reading therapy dog. She sits everso attentively on a table as children take turns reading stories to her. 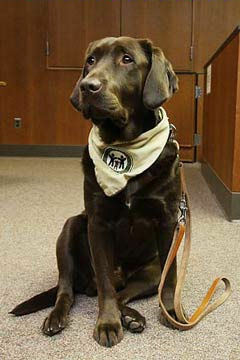 Amos is the support dog of the Canine Advocacy Program where he assists children in court and in group settings for those who were sexually assaulted. Program Director, Dan Cojanu, reported Amos does not leave the child until a hug, kiss, and smile are shared. FIDO Friendly had the opportunity to peek inside the beautiful minds of these canine heroes who leave no child behind. FIDO Friendly: How did you get started doing supportive work with your dogs? Lisa Saroyan: Minnie was an overbred dog, had been abused and had some serious socialization issues. My mission became to help teach her that the world isn’t so scary. With training and exposure to the outside world, she began to really like people. I felt therapy work wouldbe a good outlet. Dan Cojanu: As I was preparing to retire as the Supervisor of the Victim Services Section atthe Oakland County Prosecutors Office in 2008, I knew I wanted to continue to be a victim’s advocate. Since I love working with dogs, this was a perfect match. I decided to build my own program in Michigan. FF: What sort of differences have you seen in the kids since doing this? LS: My dogs have their own classroom with an aide. Twice a week the children come and read to them. This is a very personal experience with the kids, as they get to read directly to my dogs without interruptions. The dogs are trained to stare directly at the kids while they are reading. The kids think this is the best thing. I stand about 10 feet behind the children and the dogs follow my commands. Overall, we see about a 30 percent increase in 12 weeks in their first and second grade reading levels. We target these grades because in the school system after third grade, if students are not at grade level, school becomes much more difficult for them. DC: Our program helps the child, the court and everyone involved in the criminal justice system. A dog brings a sense of security that cannot be duplicated even by professionals in the field. FF: What do you find to be the most rewarding part of this chosen path? DC: When I first meet a child, they are terrified about testifying. They know they will have to tell the most intimate details of their victimization in front of a group of total strangers. The hours spent waiting to testify only intensifies this fear. Once Amos is introduced, you see an immediate drop in the anxiety. They do tricks with Amos, petting, taking him for a walk and many times, draw pictures of him. Again, this alleviates much of the anxiety associated with waiting to testify. They are also assured Amos will be waiting when they are done. I have the best job in the world. FF: How can readers learn more if they are interested in their dog being involved? LS: Successfully complete the Canine Good Citizen test with your dog. Be sure your dog is okay with loud noises, people and being out in public. DC: These types of programs are gaining in popularity at a very fast rate. Visit our website for more information about Amos and the program. PO Box 20227, Cheyenne, WY 82003; (877) 843-7364; therapydogs.com. The Canine Advocacy Program (CAP) was developed to provide service dogs to help ease anxiety associated with child victims involved in the criminal justice system. Note: Content may not be copied or used without expressed previous written consent from FIDO Friendly magazine.